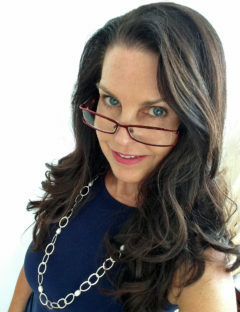 Life is crowded with the priorities of work and home, and they often keeps us frantically rushing from one to the other. But in the best world—and to the benefit of those on either end—we could use a buffer zone. A place to gather, complain or celebrate, and crucially, feel connected. Michael Hickey, a community development consultant, called such community hangouts “third spaces.” He discovered that nine times out of ten, it’s a bar. Call it a tavern, pub, or micro-brewery, but it maintains eternal essentials: taps, stools and an amiable air. In an article titled, In Praise of (Loud, Stinky) Bars, Hickey wrote, “The vaunted ‘third space’ isn’t home, and isn’t work—it’s more like the living room of society at large. 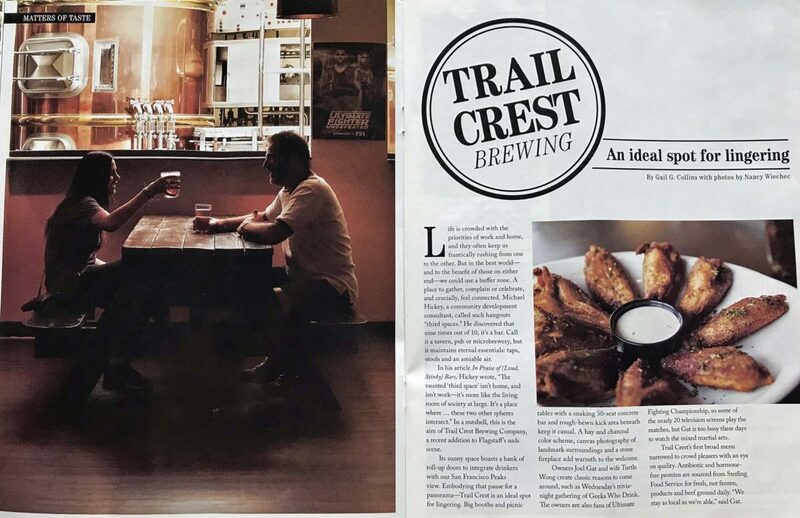 It’s a place where … these two other spheres intersect.” In a nutshell, this is the aim of Trail Crest Brewing Company, a recent addition to Flagstaff’s suds scene. Its sunny space boasts a bank of roll-up doors to integrate drinkers with our San Francisco Peaks view. Embodying that pause for a panorama—Trail Crest is an ideal spot for lingering. Big booths and picnic tables with a snaking, 30-seat concrete bar and rough-hewn kick area beneath keep it casual. A hay and charcoal color scheme, canvas photography of landmark surroundings and a stone fireplace add warmth to the welcome. Owners Joel Gat and wife Turtle Wong create classic reasons to come around, such as Wednesday’s trivia night gathering of Geeks Who Drink. The owners are also fans of Ultimate Fighting Championship, so some of the nearly 20 television screens play the matches, but Gat is too busy these days to watch the mixed martial arts. Trail Crest’s first broad menu narrowed to crowd pleasers with an eye on quality. Antibiotic and hormone-free proteins are sourced from Sterling Food Service for fresh, not frozen, products and beef ground daily. “We stay as local as we’re able,” said Gat. Let’s start with those chubby chicken wings. The Jamaican jerk style bares meaty heat in every bite of the juicy wings. Dip into the horseradish side for added kick and perfect pairing. Chef Travis Hale took over the helm in July to refine the menu and move the BBQ up a notch. The soups vary each day. The tomato spoons up as a creamy bowl of zip with basil chiffonade, and classic French onion seals an earthy broth with crusts and melted cheese. Share the hummus trio with standard garlic, bright beet and jalapeño for scooping with scratch-baked rye toasts or petals of pepper as a colorful starter. Get your greens with the grilled chicken salad. Several tender breast slices top spring mix and spinach with charred apple wedges, candied pecans, goat cheese and citrus vinaigrette for a lively, textured bowl. The buffalo chicken wrap builds a bountiful bundle of chopped breast in jazzy sauce plus plenty of salad fixings, buried in shoestring fries. The portobello sandwich on house brioche presents a flavor bomb of weighty mushroom, sweet peppers, spinach and provolone—a messy, veggie option. 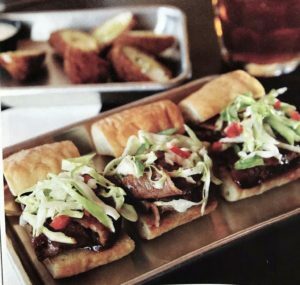 Equally messy are honeyed brisket sliders with coarse cabbage and pepper slaw. Sides include large, moist onion rings in airy beer batter—of course—breaded and fried, home-jarred pickles with crunch and vinegar for an i-dill change or breaded artichoke hearts stuffed with goat cheese, all upgraded with a swipe of tangy ranch. An ample game area extends affordable and flexible seating options for groups of 200-plus. Fussball and pool tables plus arcade-style amusement share hoppy company with the brassy brewery equipment. A few permit snafus held up Trail Crest’s beer production, but it will be up and running for the company’s first anniversary in September.